Pictures cropped from an American Life magazine article on The Beatles, prior to their first visit to the U.S. in February 1964. 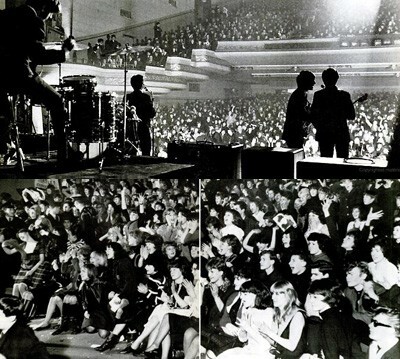 The show at the ABC Ardwick ( Apollo ) was well covered- Pathé News filmed two songs, backstage, and scenes of the hysterical audience, for their 'The Beatles come to Town'. The film tells us that fans bought half the tickets by post the rest being queued for for two nights by 5000 fans! With only a lucky 2500 getting a seat. There's some charming scenes in the newsreel of the manager instructing his staff how to behave. ( -probably not the "punch them in the head if they stand up" approach I recall from the early 1980's . )If you study the photo of the crowd there are a few faces recognisable from the footage. Granada also had a crew there for 'Scene at 6.30.' as well as BBC Radio doing an interview for their 'Voice of the North' programme. If you follow the link you can see the whole of the Newsreel on You Tube. An ace photo of a class venue! Is there anybody out there who actually attended this show? My partner went to see them in Southport in 1963. Also when did the venue start being the Apollo? In the article in Life magazine it calls it the 'Manchester Apollo'- no mention of the ABC cinema, yet if you look at the ticket stub ( elsewhere on MDMA ) its the ABC Cinema, Ardwick. Great footage of the Beatles. I see they brought the 5th member with them. The stage moniters must of been turned up to number 11! Those were the days. Regarding the 'Apollo' name, I contacted my friend who used to manage the Apollo Theatre and he in turn has got in touch with some staff from the past. The Apollo Cine Theatre was opened by Margaret Lockwood on 28th August 1938. Owned by Anglo Scottish Theatres Limited it cost £175k to build and its opening capacity was 1750. The main contractor was C R Roy of Manchester. The inaugural man at the helm was Mr Stan Blomfield with the resident organist being Mr Reginald New. The original phone number was ARD 1141…………………………In summary its always been the Manchester Apollo a legendry venue! For those interested I paid £175 for an opening night programme at an antiques auction two yeas ago. There was some rumour that it got the name Apollo because Mrs G wanted Mr to dress up as a Greek god………………..but the programme dispels such notions! I suspect it had the ABC name for a while during the 60s, though Apollo was its original name. Apparently whether it has been part of / or sponsored by ABC Cinemas, Labatts, Carling etc it has always been called the Apollo.